SPRINGFIELD, Ill. -- Gov. Bruce Rauner has vetoed legislation to overhaul a Chicago public employee pension program. The Republican vetoed the measure Friday. He says it creates a "fiscal cliff" that will boost taxes beginning in 2023. The Legislature sent Rauner the plan in January. He indicated then he didn't support it. It would have required laborers and municipal workers to contribute more to their retirement. In exchange they could retire at 65 instead of 67. It also would have raised revenue from increased taxes on water and sewer services. Rauner says the combined deficit in Chicago's pension funds is $30 billion. Rauner released a video explaining his veto. You can read his veto statement below. A spokesman for Chicago Mayor Rahm Emanuel released a statement saying, "The governor continues to make one irresponsible and irrational decision after another, and his veto today is the latest example. This bill passed with overwhelming bipartisan support because it improves our fiscal stability for taxpayers and shores up pensions for thousands of retirees who earned them. Instead of helping secure the future of our taxpayers and middle-class retirees, the governor chose to hold them hostage - just as he has done to social service providers, schoolchildren and universities across the state. The governor's actions are harming the most vulnerable in our state, and the people of Illinois deserve better." A similar measure has been reintroduced in the Senate. 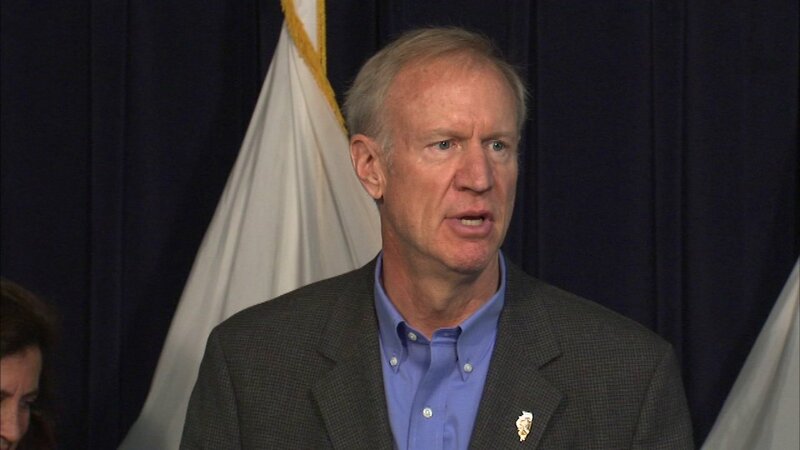 Earlier Friday, Governor Rauner called on state lawmakers to support a different pension reform plan that would also provide $215 million to CPS. It's a proposal that stalled last year in Springfield, but now, GOP House Leader Jim Durkin and 25 other Republicans say they will support the measure. In a statement, Chicago Public Schools CEO Forrest Claypool said the governor continues to fund schools in predominantly white parts of the state while providing less funding for Chicago Public Schools. "Today, I veto Senate Bill 2437 from the 99th General Assembly, which makes changes to the Chicago's municipal and laborer pension funds. This legislation allows members of those pension funds hired between 2011 and 2016 to opt to pay more in employee contributions, in exchange, those members could retire at age 65, rather than 67. Additionally, it allows new members to the system to retire two years earlier while also increasing their employee contributions. While I appreciate the effort to address the insolvency of certain pension funds for Chicago's public employees, the legislation will create another pension funding cliff that the city does not have the ability to pay. This legislation will result in increased taxes on Chicago residents. This veto also reflects a concern that the legislation would do nothing to address the overarching problem of underfunded pension systems throughout our State. Chicago pension funds alone face a combined deficit of around $30 billion. Our state pension funds are collectively underfunded to the tune of $130 billion. Short-term fixes like Senate Bill 2437 are not the answer and in fact are what has led to our current pension woes. This practice has to stop. I encourage the General Assembly to pass comprehensive pension reform for our pension systems across the state and to protect our taxpayers from the rising costs of these unfunded systems. Therefore, pursuant to Section 9(b) of Article IV of the Illinois Constitution of 1970, I hereby return Senate Bill 2437, entitled "AN ACT concerning public employee benefits", with the foregoing objections, vetoed in its entirety."